A photo of Venus taken by the solar sail-powered craft Ikaros has been released by JAXA, the Japan Aerospace Exploration Agency. 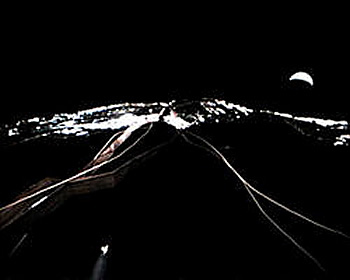 The picture shows a crescent-shaped planet Venus, and the cords and solar sail of Ikaros in the foreground (see JAXA photo below). "It is proof that the solar-sail powered craft, once thought to be in the realm of science fiction, has reached Venus," said JAXA. The Ikaros craft was launched in May last year. After deploying its 14-square-meter resin film sail, the craft began moving using the minute pressure exerted on the sail by the sun's rays. Using liquid-crystal devices on the sail to make adjustments to the ratio of incoming and reflecting light on different parts of the sail, Ikaros has successfully been able to steer its direction, accelerate and decelerate. It has traveled around 500 million kilometers and is continuing to take measurements with devices on the sail that should help reveal the distribution of cosmic dust. Currently, Ikaros orbits the Sun once every 10 months, and in five years it will pass near Earth. Although the idea of a solar sail is not original to sf writers (in the 1920's, Konstantin Tsiolkovsky and Fridrich Tsander wrote about "using tremendous mirrors of very thin sheets... using the pressure of sunlight to attain cosmic velocities"), fans remember the light sail from Jack Vance's excellent 1962 short story Sail 25 and the interstellar starlight sail from Cordwainer Smith's 1960 story The Lady Who Sailed The Soul. Learn more about Ikaros, as well as other JAXA projects, like the Try Zero-G project, the Space Toilet Diaper and the Space Fireworks program.